Dahod is a small city on the banks of the Dudhimati River in Dahod District in the State of Gujarat, India. It is said that it have taken its name from Saint Dadhichi, who had an Ashram on the bank of Dadhumati river. The city serves as District Headquarters for Dahod District. It is 214 kilometres (133 mi) from Ahmedabad and 159 kilometres (99 mi) from Vadodara. It is also known as Dohad (meaning "two boundaries", as the borders of the states of Rajasthan and Madhya Pradesh are nearby). Mughal Emperor Aurangzeb was born in the fort of Dahod in 1618, during the reign of Jahangir. Aurangzeb was said to have ordered his ministers to favour this town, as it was his birthplace. Tatya Tope, the freedom fighter, is known to have absconded in Dahod. He is believed to have lived his last days in this region. It was previously within the boundaries of Panchmahal District. The area of Godi Road/Godhra Road has been considerably developed, making the overall residence and commercial area very expansive. Urban Bank Hospital is situated here. The foundation stone for a dental college was recently laid by the trust of philanthropist Girdharlal Sheth. 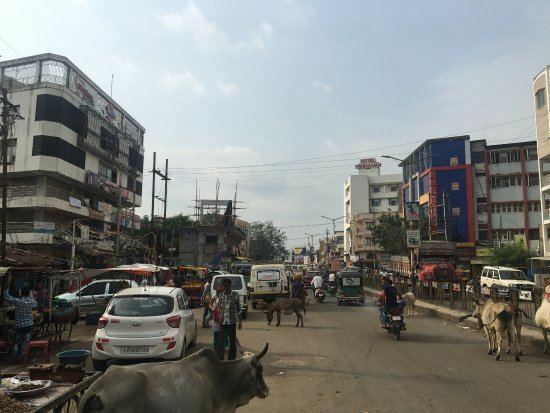 Dahod has been selected as one of the hundred Indian cities to be developed as a smart city under Prime Minister Narendra Modi's flagship Smart Cities Mission. 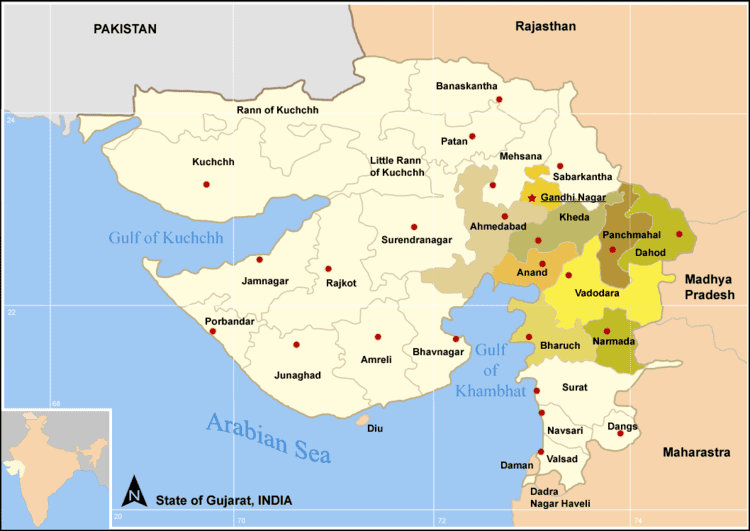 As per the 2011 census, Dahod had a population of 791,685. Males constituted 52% of the population and females 48%. Dahod had an average literacy rate of 45.65%, lower than the national average of 59.5%. Dahod town has many educational institutions like Hindi Higher Secondary School, Hindi Primary School, St.Stephen's Higher Secondary School, Government Engineering College, St' Mary School, Government Polytechnic, M.Y. High School, Little Flowers School, Jamali English School, Burhani English Medium School, R.L Pandya High School, Sunrise Public School, Kendriya Vidyalaya ,Jawahar Navodaya Vidyalaya, shree gnanjyot secondery and high secondery schoole (form ukkardi) and Aadivasi secondery and higher secondery school rachharda himala (from Anas) among others. Kachori,Samosa and Pakodi are the main namkeen of the city. Dahod is also known for 'Son papadi, Mattha and Pakwan. Dahod is also a medical hub for Gujarat, and surrounding areas of Rajasthan and Madhya Pradesh. Dahod hosts some non-profit health centers like Urban Bank hospital, Anjuman Trust, and Government Hospital. Drashtri Netralaya is a famous non-profit eye clinic with a staff of 20+ specialists. It also offers a Diploma in Optometry course. In recent years, the real estate in Dahod has increased in value considerably. The town's Najmi Masjeed mosque, inaugurated in 2002, is one of the largest mosques in the Dawoodi Bohra community. Sachin Desai wrote Gujarati books about Dahod: 'દાહોદ ડોટ કોમ' and 'Atit na ovare, vikas na pagthare Dahod'. He also wrote a weekly column Dokiyu from last 24 years. Sachin Desai & Gopi Sheth have also managed a Gujarati news website, founded in 1995–'96. They both give daily updates of Dahod to more than 45,000 residents via Dahod Google Group. Dahod Online is another website, created by the youth of Dahod. The people of Dahod are very polite and secular to every religion and live peacefully which makes the unique feature of Dahod. Many legends are born here working in the different fields such as doctors, engineers, scientists, actors etc. Dahod Television Network also known as DTN is the local news channel of Dahod which telecasts weekly news of Dahod owned by Kaidbhai Chunawala and anchored by Dr. Bhupendra Chaudhary who has worked in many Gujarati, Hindi, Haryanvi films as well as done many serials on renowned channels such as star plus, colors etc. Dahod is also famous for its handicraft products by Sahaj-An Organisation for Women's Development, an NGO with outreach to 3000 women, Founded in 2001 by Jabeen Jambughodawala, Sahaj Create fine handicraft products and an established brand in tribal handicraft in India and the world. Sahaj India is their website which provides information on their products and events. Dahod is connected to all major towns of Gujarat by public transport service operated by GSRTC. And Dahod is Railway Junction that connects Dahod with different parts of state and nation.